Our department adopted MicroCase as its standard statistical software in 1998. The decision was linked to a belief that the department’s curriculum needed to be moved in a more “skills-based” direction to ensure that sociology and criminal justice majors graduated with marketable strengths. This academic year constitutes the tenth year of employing MicroCase across the curriculum in both disciplines. The situation before 1998 was much different. As Professor Ted Goertzel notes: “When I began teaching Methods of Research at Rutgers Camden, the computer was in the basement of Armitage Hall. There was just one for the campus, what we now call a “main-frame” computer. There was a room full of card punch machines. We typed lines of code on this machine and they were punched with holes into cards. We then put a “deck” of these cards in a file drawer and the computer staff ran them through the computer. After an hour or so, we got a printout of our results. Usually there were errors and the cards had to be repunched and resubmitted. Further information, including online tutorials and examples of MicroCase exercises designed by our faculty, may be found at our MicroCase Resources web page. Read this before you register! Pre-Registration for the Spring 2008 Semester begins on November 4th. All students are strongly encouraged to see their departmental advisor in planning their schedule, especially those who expect to graduate in May. Degree Navigator (click here for student access) remains a great tool, but students combining a major and minor in the department should be sure to consult their advisor–DN sometimes makes mistakes in this case. Be sure that you have the required combined credits. All Sociology and CJ majors should take Methods and Techniques of Social Research (920:301) as soon as possible. This course is a prerequisite for a number of upper-level courses, and knowledge of MicroCase and the basics of data analysis are increasingly expected in all upper-level courses. Note: the methods course also fulfills the second math requirement in the CCAS curriculum. Dr. Goertzel’s spring 2008 Communication class (920.341) counts both as a sociology elective and as a “writing intensive” course in the college curriculum. Selected Urban Studies courses can count as one elective in the sociology major. Check the sociology major webpage for details. Many of your questions about advising may be answered by consulting our department’s Sociology Advising Page and our Criminal Justice Advising Page. Winterim: Museums and Culture. 070:485. 12/21/07 F, 1/2/08-1/17/08 M,Tu,W,Th 6:00pm-9:40pm. Taught by Patrick McCarty. Click here for detailed description. Spring Semester: Children and Consumer Culture. 920:346. MW 1:20-2:40. Taught by Prof. Dan Cook, a sociologist who has joined the Department of Childhood Studies. Counts as sociology elective. Click here for detailed description. Prof. Cati Coe has received a two-year grant from the Cultural Anthropology program at the National Science Foundation (NSF) to support her research on the lives of Ghanaian immigrant families. NSF grants to anthropologists are rare, so this is a special honor. Dr. Coe is particularly interested in how the traditional practice of child fosterage (in which a child is raised by adults other than his or her birth parents) is being used by Ghanaian parents who have traveled to the U.S. to live and work. NSF will be supporting one stage of this longer project, in which Dr. Coe will be doing a household survey in one small town in southern Ghana, to determine how the child-raising practices of transnational migrants differ from urban migrants. If you are interested in knowing more about how immigration impacts family arrangements, you might consider taking Dr. Coe’s anthropology course in the spring on Immigration and Families. Dr. Coe is a member of the Working Group on Childhood and Migration, which is hosting an interdisciplinary Conference on Childhood and Migration in Philadelphia next June. Prof. Monika Wood’s innovative Sociology of Aging course simulation exercises were recently discussed by editor and author Jason Wilson on National Public Radio (NPR). The Talk of the Nation show on Teaching the Young to Emphathize with the Oldaired on October 11, 2007. In it, Wilson recounts how, with corn kernels in his shoes, tight bandages around his knees, plugs in his ears, a cotton ball in one nostril, and breathing through a straw, he developed a new appreciation of people who cope daily with pains, stiff joints, and poor eyesight and hearing. Prof. Patrick McCarty, an adjunct faculty member of the department, recently completed work on McGraw-Hill’s Online Learning Center, a website created to assist students and instructors who use McGraw-Hill’s anthropology texts. Professor McCarty worked on websites for two texts: John Relethford’s The Human Species: An Introduction to Biological Anthropology, and Michael Park’s Introducing Anthropology: An Integrated Approach. For the student websites, he revised and updated virtual explorations, exams and quizzes, chapter overviews and outlines, and learning objectives. For the instructor side of the website, he created new PowerPoint presentations for each chapter. McGraw-Hill has cited Professor McCarty’s contribution and Rutgers-Camden is mentioned on the website. The virtual explorations appear in the print edition as well. Feel free to explore these two sites, which include audio and video files as well. One of the most successful student projects in our department involved making a film on Germantown Avenue in Philadelphia to illustrate key themes in Elijah Anderson’s award-winning Code of the Street, a book used in the department’s social stratification class, among others. The film was presented by students James Flatley and Etienne Jackson at the Eastern Sociological Society in the spring of 2005, and has remained available in several formats at the film website. Requests for the DVD version continue to come in almost weekly, indicating that the film is used in classes all over the country. 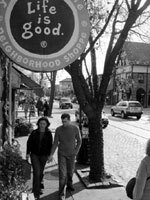 Recently, Designer/Builder: A Journal of the Human Environment reprinted the section of Anderson’s book on Germantown Avenue, and received permission to use a number of the still photographs taken by the students and Prof. Wood as part of the film project. Ten of these photographs (in black and white, conforming to the journal’s format) illustrate the text in the October 2007 issue. Designer/Builder is distributed to all members of Architects/Designers/Planners for Social Responsibility. Students who would like a free copy may pick one up on the fireplace mantle in the student lounge in the sociology building. Free Books Available in Sociology Lounge! The books in the bookcases in the student lounge on the second floor of the Sociology building are available free to those who will use them! Most are contributed by faculty members who no longer need them, and there is a an excellent mix of sociology, anthropology and criminal justice texts and monographs. The texts particularly make excellent reference sources for many courses (but be sure to cite them if you use them for your assignments). There are books on specialized topics as well–right now there are a particularly large number of books on Japan, for anyone interested in that fascinating and important country. The selection keeps changing, so it’s a good idea to check it out periodically. The price is just right! In April 2007, Dr. Hazzard-Donald’s special topics class, The Red and the Black: American Indians and African Americans in the North American Environment, visited the National Museum of the American Indian in Washington, D.C. Dr. Hazzard-Donald said the opportunity to experience the exhibits on native history, beliefs and contemporary life was a wonderful complement to the course. During the lunch break at the museum’s cafeteria, students selected food from a variety of traditional and updated American Indian cuisine including buffalo cheese burgers, dishes of corn, squash, soups and stews, and even a raw fish selection. Students proclaimed the trip a great success and a great learning experience. Funding from the African American Studies program and the department made this unique and valuable experience possible. For the first time in the department’s history, one of our majors is being offered off campus. Starting this semester, students will be able to earn a bachelor’s degree in criminal justice by taking courses offered by Rutgers on the campus of Atlantic Cape Community College (ACCC) in Mays Landing. The program is targeted to students who have earned an associate’s degree and would like to obtain their bachelor’s closer to home in southern New Jersey. The program is starting small, but students are very enthusiastic about the terrorism course that’s being offered this semester, taught by Dr. Mark Anarumo, who also happens to be an Air Force Colonel with extensive counter-terrorism training (watch for the same course in Camden this coming summer!). In the spring, we’ll be offering “The Poor, Minorities and Justice,” taught by Professor Baron. Course offerings will expand as the program develops. Exceptional. Wonderful. Great. Dedicated. Brilliant. All these and more are adjectives that students have used to describe Professor Robert Wood. They are representative of the accolades that he receives regularly from students in his courses, who consistently appreciate his enthusiasm, careful course preparation, innovative use of Web-based and other instructional technologies, and his openness and availability to students. In May, the university recognized these qualities when it awarded the prestigious Lindback Distinguished Teaching Award to Professor Wood, in recognition of his lifetime achievements in teaching and his commitment to undergraduate education. The Lindback Award is simply the most recent of Professor Wood’s teaching honors, which also include the Provost’s Award for Teaching Excellence in 1996, the Warren I. Susman Award for Excellence in Teaching in 2000, and the Outstanding Contribution to Instruction Award presented by the American Sociological Association in 2002. If you’ve never had the opportunity to take a course with Professor Wood, you may want to register for one of his courses next year, after he returns from his sabbatical. At left: Prof. Wood with Masterson Awardees Kristin Curtis and Linda Anderson, and with Margaret Marsh and Michael Palis. Click here for a streaming video of Acting-Provost Margaret Marsh presenting the award. If you’re not yet familiar with it, we recommend exploring our website, which provides a broad array of resources to assist you in finding the information you need and in doing well in your courses. As the illustration below shows, the website is divided into two sections, the departmental homepage and the web-enhanced curriculum, each with its own set of resource links. Check it out! There are resources to help you do well in your courses! You can learn more about our web-enhanced curriculum in the online journal, Innovate,which included an article about our department in its first issue by Prof. Wood, entitled“Scaling Up: From Web-Enhanced Courses to a Web-Enhanced Curriculum.“ To access it, you must register for free at the Innovate site (just unclick the box about promotions if you don’t want to receive them). It’s a good way to learn about how the department is using technology to enhance teaching and learning and what its website has to offer you. April 1, 2008 . Contact Jane Siegel with comments or questions. Page last updated by Sociology, Anthropology & Criminal Justice at 9:06 pm August 9, 2017 . This page was printed from http://sociology.camden.rutgers.edu/news/newsletter/fall-2007-newsletter/ at 10:37 PM Thursday, April 25, 2019.